For me, the best thing about living in Europe is the ability to travel to amazing places quickly and cheaply. So when Konstantin got three days off, we knew it was time to head to his home country of Germany. It would be my first time there, and my 58th country visited! We booked train tickets at a steal: just under €200 return for both of us. 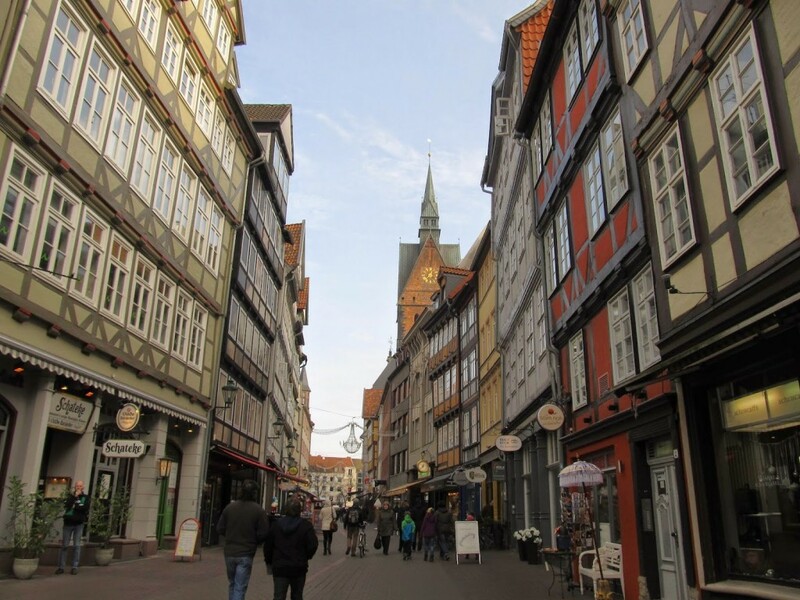 Konstantin’s family lives in the small town of Springe, which finds itself in the fantastic location of being within reachable distance of Hamburg, Hameln and Hannover – so we decided to visit all three! We headed for Copenhagen Central Station and hopped on the ICE train early in the morning, settling in for the journey to Hamburg. At only 4 1/2 hours, it’s a comfortable trip, especially since it’s broken up by a ferry ride. That’s right, the train goes on the ferry from Rødby Farge, Denmark to Puttgarden, Germany. The train pulls up to the belly of the ship and follows the track on board. Once safely parked, the passengers climb up to the decks of the ferry and enjoy the 45 minute ride. Our ship, the Princess Benedikte, was well equipped with two restaurants and a duty free store. We enjoyed the fresh air in the chilly but bright weather out on the open deck, then had a light lunch in the cafeteria below. Then, it was already time to return to the train! 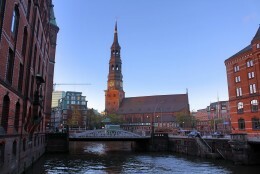 We arrived in Hamburg at 12:30 in the afternoon, and had seven hours to explore the city. 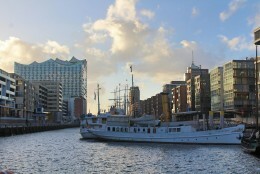 Our first destination was HafenCity – the harbour city. 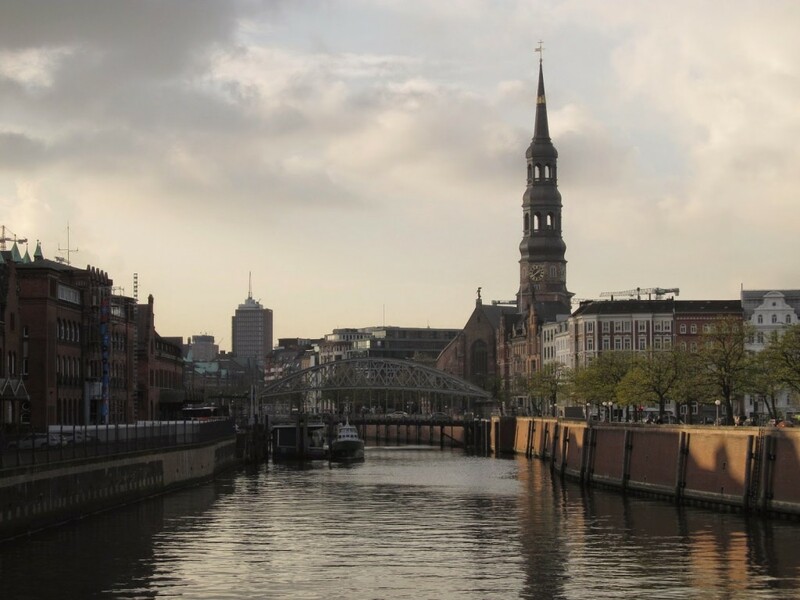 We strolled the canal lined with tall ships and admired the mix of historic and modern architecture. 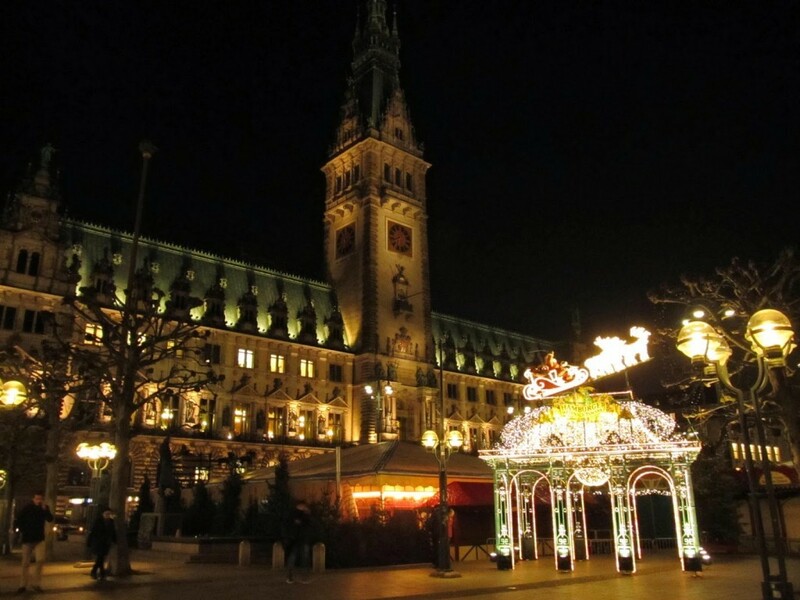 From there, we took the Metro to the City Centre and headed for the Rathaus (City Hall), where the Christmas Market was being built, opening only four days after our visit. It looked beautiful, and I was truly sorry to miss it! We explored the pedestrian shopping streets, then found a cute little Italian place for lunch – with German beer of course. 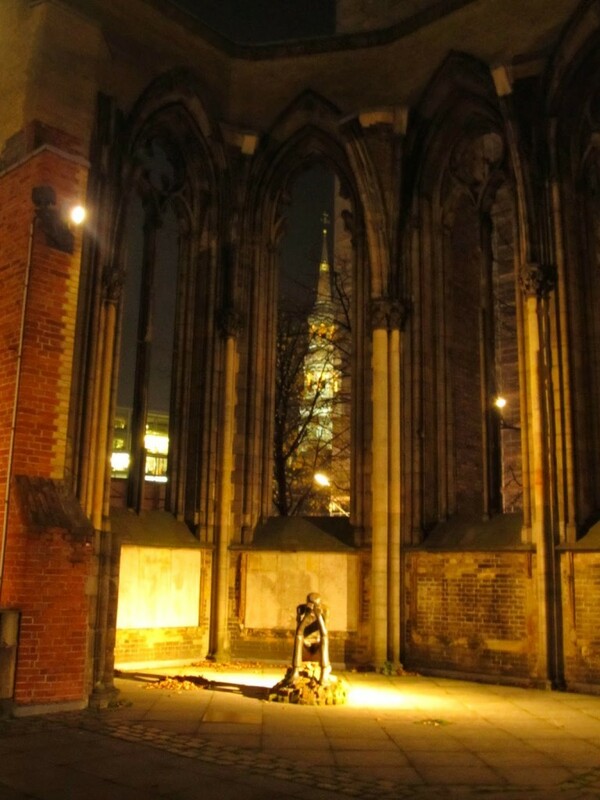 We then visited the Saint Nikolai Memorial: once a church, Saint Nikolai was destroyed by Operation Gommorah in 1943. Only the tower and the rear wall were left intact, and they now serve as a memorial and a museum. 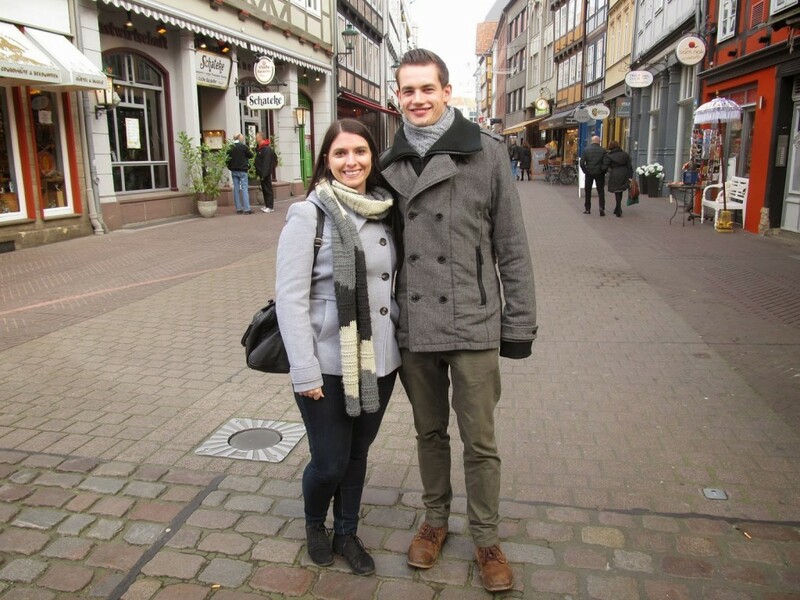 On our final stroll before catching the train to Springe, we walked the shopping streets, taking in the detailed facades, the painted arcades, and the high-end shops. 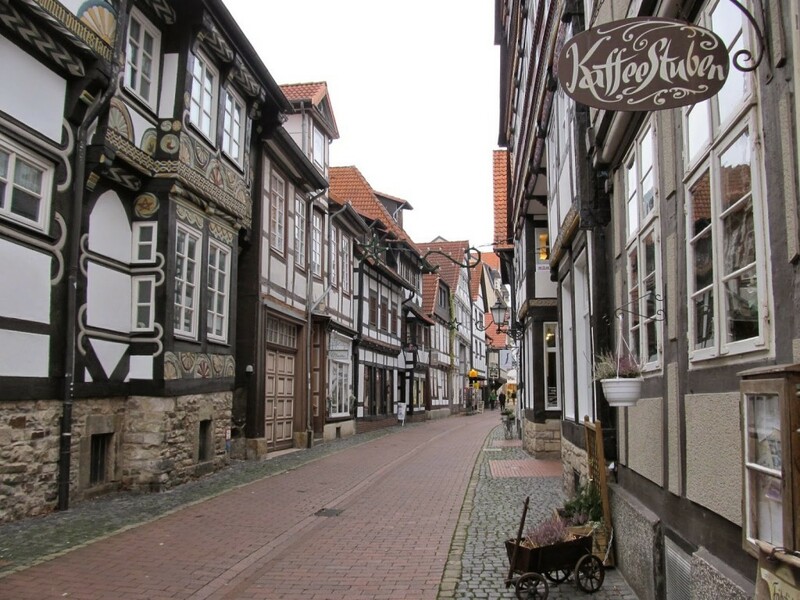 It wasn’t until we arrived in Hameln that I realized that it was the setting of the story of the Pied Piper. Tributes to the tale are found around the town, from carvings and murals, to brass cobblestones featuring rats. 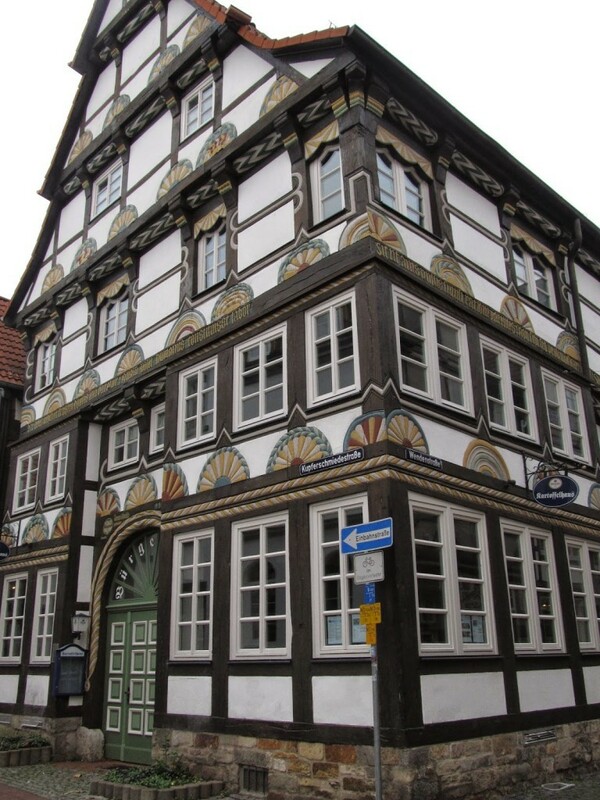 The most incredible thing about Hameln, though, was the buildings. Traditional timber houses, carved with intricate patterns and lettering. The words are the names of the building’s original inhabitants, along with their profession and often, a psalm. They were absolutely gorgeous and I couldn’t stop looking up and marvelling at them all. My favourite spot was Wendenstrasse, a small, curved street, where we stopped at Kaffee Stuben for a bite. 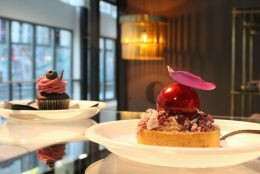 Set in one of the old houses, the cafe is spread throughout several little rooms, quaintly decorated with antiques and collectibles, while cake plates and needlepoint line the walls. 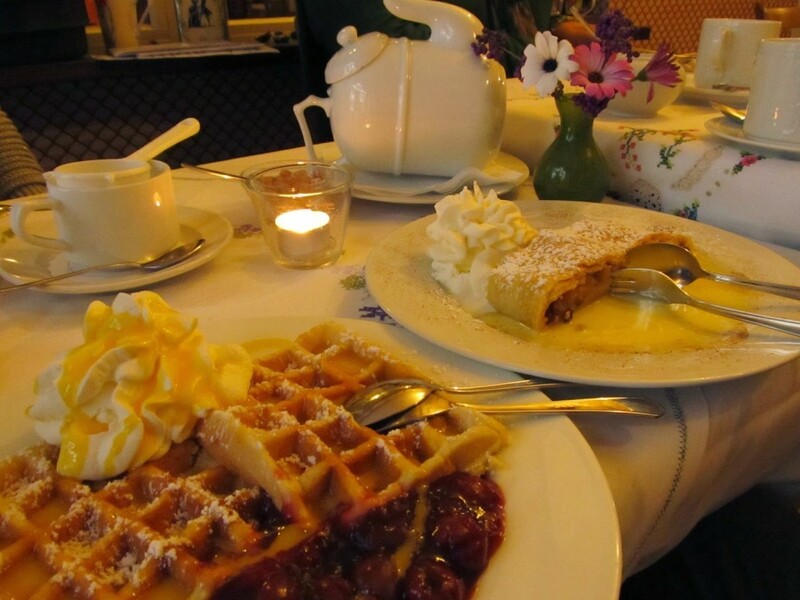 We feasted on waffles with cherries, whipped cream and egg nog, and apple streudel with vanilla sauce, sipping on tea and hot chocolate. It was heavenly. with incredible animatronic window displays, giant decorations, and another market being built. We strolled along the pedestrian street, passing the incredible old City Hall, in the shadow of the imposing Cathedral, and headed to the Hannover Market Hall. The building was bursting with stalls selling a range of goodies – cheeses, pretzels, beers, and lots of sausage! We sat for a quick drink and took in the bustling local atmosphere. Our next stop was the Old Town, which is actually a replica of the original, which was destroyed in the war. Passing a virtual forest of evergreens being prepared for the Christmas Market, I could smell the holiday season in the air. 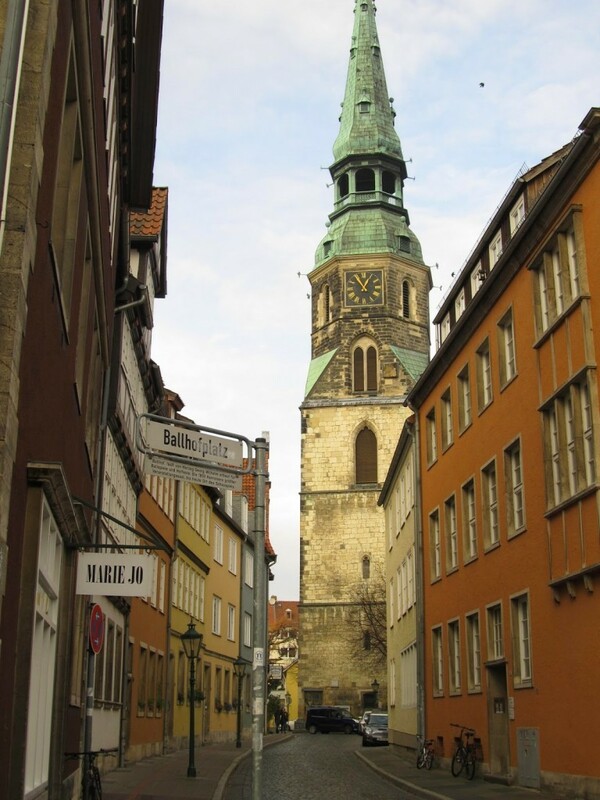 We walked along Kramerstrasse, a charming and photogenic little pedestrian street which led to the Cathedral. We decided to get some lunch before catching the train. Ideas were thrown around, until I suggested some German food. 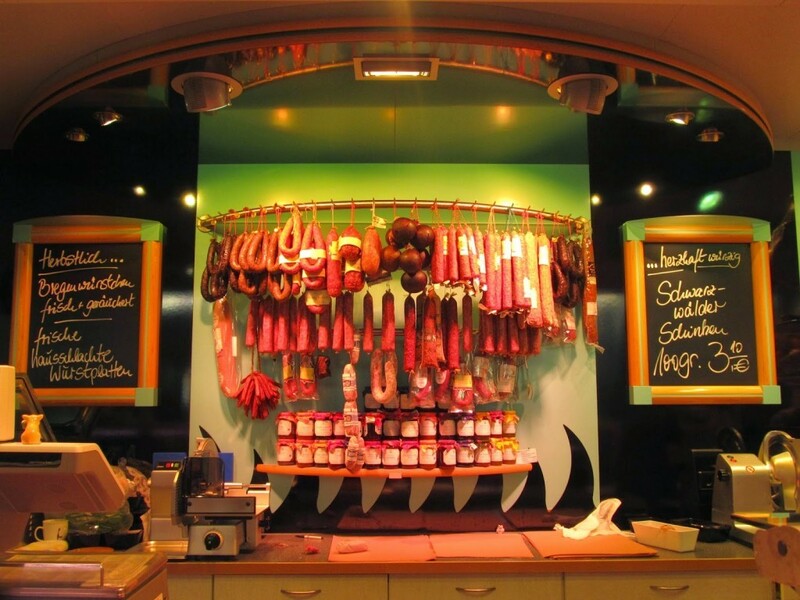 After all, it was my first visit to Germany and I hadn’t yet eaten anything traditional. We went to Restaurant Brunnenhof, located in the Central Hotel Kaiserhof, just by the train station. We feasted on traditional fare, something Konstantin and his family never do at restaurants – they only eat German-style food at home. 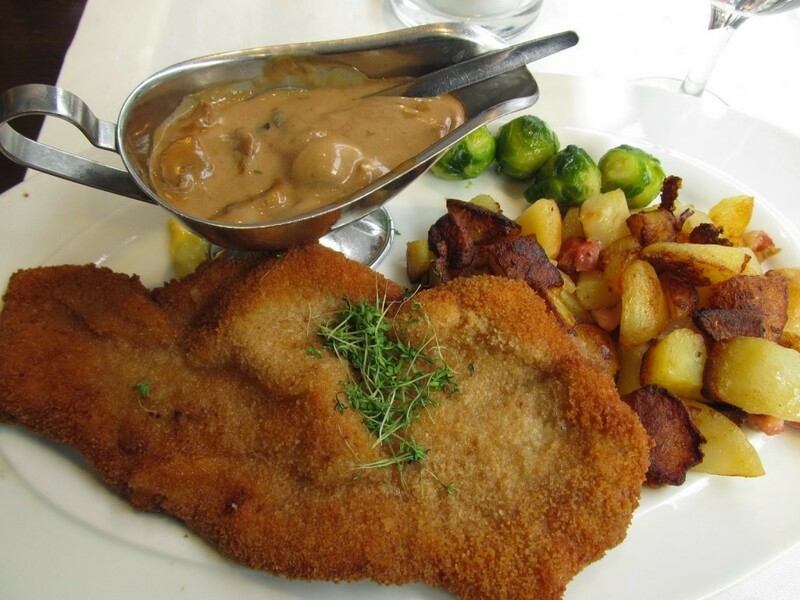 I had a breaded pork schnitzel with a creamy mushroom sauce and bratkartoffeln – fried potatoes with bits of bacon, while Konstantin tried a venison stew with traditional spaetzel – a heavy egg noodle. It was a satisfying end to my first trip to Germany. Even though the return trip was longer, as we were travelling from Hannover, it passed quickly. The ferry was much quieter, though the seas were rougher and made for a bumpy ride. We bought a Ritter Sport Advent calendar in the duty free shop – some German chocolate to remind us of our first trip to Konstantin’s country together, the first of many to come.